This blog is for those startups and entrepreneurs who are interested in developing on-demand food delivery apps like UberEats. We’ve curated 3 highly-effective strategies of uber for delivery that can help you to expand your on-demand food delivery business. ‘The Uber’ is a Goliath, which has been blanketing the earth with its aim to be everywhere from the cab booking app to uber for delivery service like on-demand food delivery, which delivers the meals at the doorstep in just 10 minutes. In a word, we can say that ‘Uber’ is everywhere. San Francisco based tech giant, UberEats has been valued at $40 billion and allowing users to request a meal via app from the nearby restaurants. Below, we’ve gathered some key data points of UberEats that can help you to know more about the insights of on-demand food ordering app. 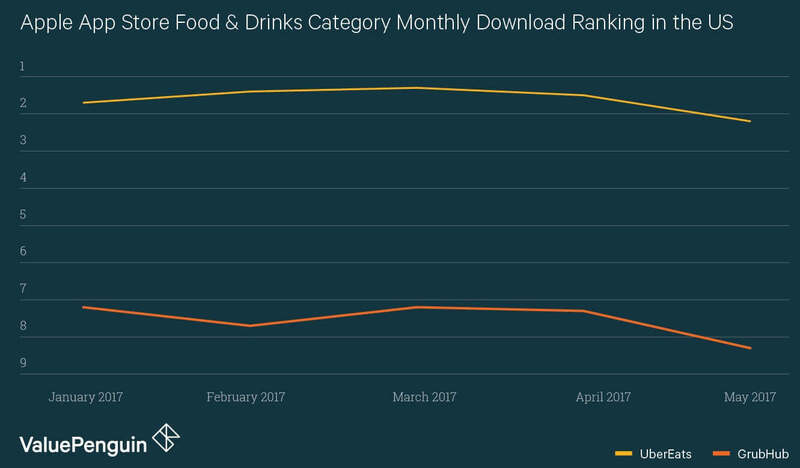 Total Download Ranking in 2017: In the below image, you can check the total download ranking of the UberEats mobile app in the United States, which was higher than GrubHub in the year 2017. In March 2017, UberEats was available in 71 cities and profitable in 3 of them. And, on October 2017, it was available in 165 cities and profitable in nearly 40 of them. 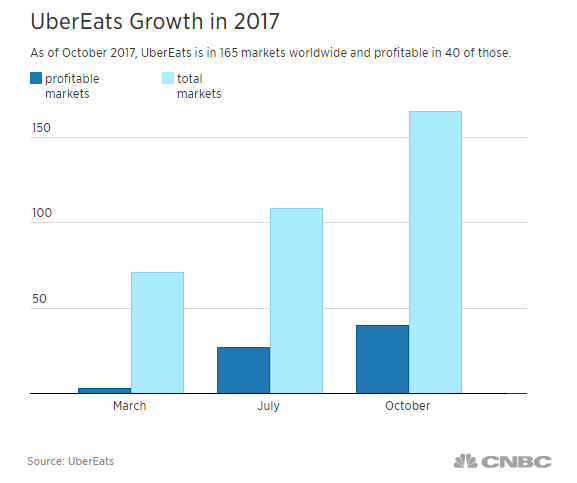 This is what you can see in the below graph that shows the growth of UberEats. Total Number of Available Cities: There’s not even the slightest doubt that Uber is everywhere, however, there is Uber’s part of the business, which has a bright spot i.e. food delivery. UberEats is available now in more than 200 cities. The new areas of operation consist of 40 new cities in the U.K, 35 in France and new cities in Ireland, Egypt, Romania, Ukraine, and Kenya. Below, we’ve rounded up three highly-effective strategies an app like Uber for food delivery that can help you to expand your online food delivery business worldwide like UberEats. Let’s have a look! Undoubtedly, UberEats has been striving hard to provide its users with unusual aspects, which make the app stands out from others. 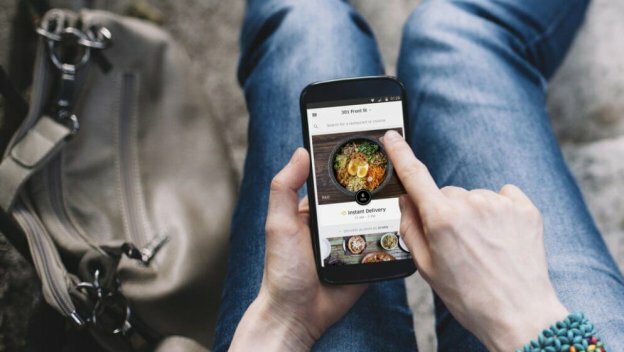 The main strategy behind the white label food delivery app UberEats is to provide customized and unique solutions to app users. This is the only way to surpass the competition. When UberEats first launched as the part of the main Uber app, lack of fast food delivery at low cost was a huge draw. Then, the on-demand food delivery business model analyzed the problem and built a unique business model than its competitors where surging prices were already there. Moreover, UberEats wanted to reach a larger audience with more specific food choices and requests. 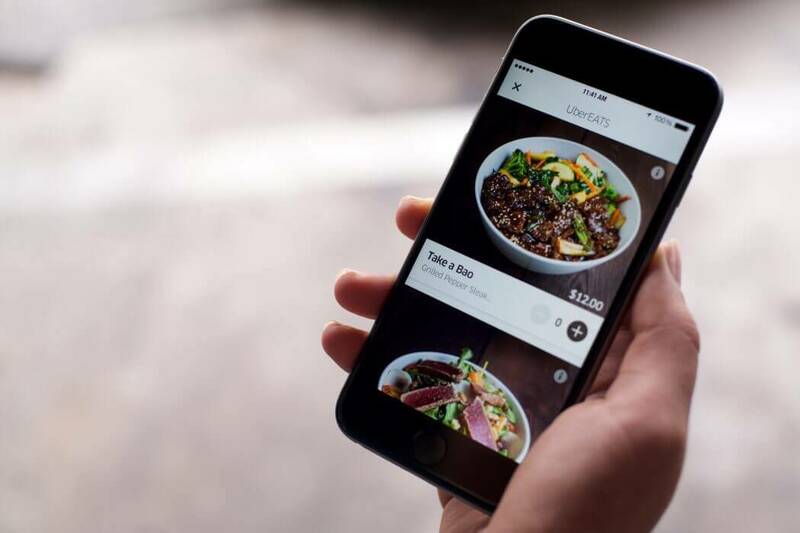 The standalone app, UberEats allows users to add special instructions where they can customize their food orders through its on-demand food delivery app. The main thing is to innovate and provide with the solutions, which can create value for app users. The bottom line is that startups need to discuss their ideas and concepts with any trusted mobile app development company, which offers Uber clone app development services. Then, it is important to analyze the targeted audience and understand their needs and choices. 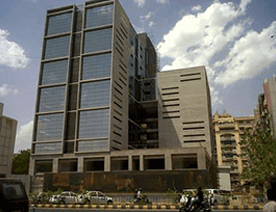 So, it will help to build an effective on-demand food delivery business model for the idea. For developing an app like Uber for delivery, the second strategy of UberEats is to start with the small, where startups can check the effectiveness of its business model. If we’re talking about the UberEats, it was started initially in Toronto rather than rolling out in other big cities like Los Angeles, Houston, San Francisco, and Chicago. This slow yet effective strategy allowed UberEats to check the feedback and react in real time, fixing out the bugs in the app and responded quickly to the issues faced by customers. 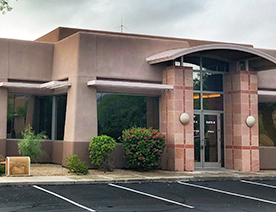 The takeaway is that the startup company needs to start its business with a small area rather than spreading across every big city. Furthermore, starting with the small and testing in the small market at the initial level can help your startup company for a smooth launch as what UberEats did. If you’ve decided to create a food delivery app like Uber, consider this strategy into your mind before establishing an on-demand food delivery business. 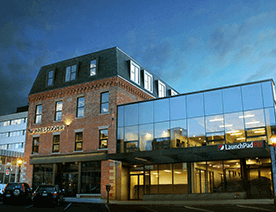 Believe it or not, the customer-centric approach can grow your business as the way you want to. This is what Uber does every time. Uber has used its well-developed business structure to transport food under the name of UberEats. It also works on the same ideas like it works on the cashless system, teams up with the various local restaurants, keeping the minimum cost and increasing the speed to maximum i.e. 10 minutes or less. Additionally, UberEats promotes food from around the world in which food menu changes on daily basis. The bottom line is that UberEats differentiated itself from its rivals at the very beginning. This on-demand food delivery mobile app provides those solutions what customers have been missed in already existed food delivery apps. So, startups also need to adopt the entrepreneurial spirit like UberEats, and let customers choose your service over hundreds. As per the report from McKinsey, “The market for food delivery worldwide stands at €83 billion”. So, it is safe to say that the on-demand food delivery service has already matured in the maximum countries with an annual growth rate of approximately 3.5% for upcoming five years. Undeniably, the on-demand food delivery market is growing. And, startups have endless opportunities to grab in the on-demand food delivery industry. The On-Demand Food Delivery is Happening! So, What’s Your Next Move? Today, the concept of on demand food delivery services has simplified the food delivery industry. With an app, it becomes easily possible for users to order the food with just a few simple taps. Moreover, these online food delivery apps are connecting food lovers to local restaurants where they have endless varieties of food to choose from and get it delivered to their doorstep. If we’re talking about the market prediction of online food delivery, then according to the McKinsey report, “the food delivery market will reach more than €20 billion by the year 2025”. Thus, it is clear that the on-demand food delivery industry will grow and touch new heights. If you have ever thought to create an app like UberEats with essential features, then it is high time to start with. Apart from this, if you may have any query like – how much does it cost to develop on-demand food delivery apps like UberEats, how to make an app like Uber, or food delivery app development, then you can directly consult us with all your queries and questions. All you just need to fill up the below-given form and we’ll revert you within 48 hours. The consultation is absolutely free of cost. This page was last edited on April 3rd, 2019, at 9:39. 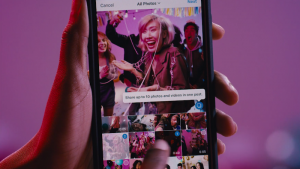 Instagram Carousels: What’s The Strategy Behind New Instagram Photo Album Feature?